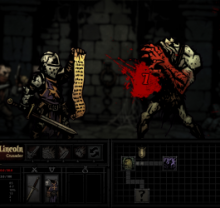 Are You Brave Enough to Delve into the Darkest Dungeon? 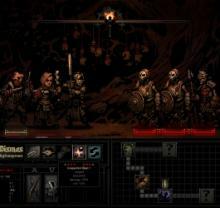 Darkest Dungeon is a new, side-scrolling, dungeon crawling, rpg barrel of goodness. It's relatively new, and has a steep learning curve. Here are 10 interesting facts about this game. In Darkest Dungeon, line position can make or break your party. Every skill has areas of the line in which they can be used. For example, the plague doctor’s battlefield medicine can only be used when he is in the third or fourth rank. If he’s up in the front two, the skill can’t be used at all. Likewise, every skill only works on certain positions in the enemy’s ranks. For example, the grave robber’s twin daggers skill only works on enemies in the second and third rank. The attack is incapable of hitting anything in the first or last rank, and won’t even be usable if there are no viable targets. Conversely, the same is true of the enemies. Some are really good at hitting up front, some bombard from the back. If you can kill them or move them around, some enemies effectiveness will be greatly diminished. Line position can be changed around at any time, even in the middle of combat. However, doing so in combat uses up the hero's turn, and should only be done if necessary. A common tactic is to keep your melee heroes up front, and ranged ones towards the back. The heroes up front will tend to get hit more. 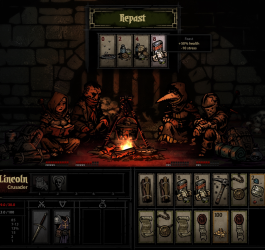 Each upgrade in Darkest Dungeons makes things a little less... dark. Need more heroes to throw at monsters? No problem, upgrade the stagecoach. Want stronger heroes? Upgrade their abilities and equipment. In Darkest Dungeon, building upgrades aren’t done in sums of gold. Instead, you collect various artifacts, heirlooms, and other antiques to trade in for better stuff. The order in which you upgrade is up to you, but getting the resources to do so should always be the highest priority. The only exception is hero upgrades, which are done through training, which costs gold. The cost varies upon the level of the skill, and some skills are completely useless in a well balanced party. The trick here is finding out a balance of where you want each hero to be, and what skills will be most helpful. I can’t believe I forgot my anniversary is today! If the hero’s stress bar fills up, they will normally develop some sort of mental breakdown that severely limits their abilities. On rare occasions, they will become virtuous instead, but more on this later. The mental breakdowns add an entirely new level of difficulty to the dungeon crawl. There’s nothing worse than having an almost dead party, and a healer who is fearful to the point where she can’t do anything. Then comes watching your entire party die in what could have been an easily solvable problem. Additionally, if heros have their stress bar filled up a second time, they will just immediately die of a heart attack. Due to this, managing stress is, in most cases, more important than their physical health. Enemies that can use stress attacks should always be high priotity. Not all heros are as stable as the next one. Through regular adventuring, heros will develop quirks. These can be good or bad. Bad quirks limit the hero somehow, or make certain things more difficult. 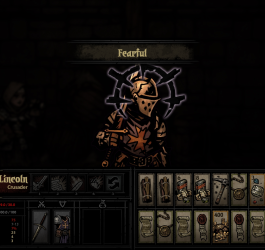 For example, it’s generally not a good idea to send a hero to the ruins when they have developed a phobia of them. They are going to get stressed faster and be less effective. Good quirks help the hero, and can give bonuses. Some heros develop a knack for finding vital spots, and score critical hits more easily. Or a hero might have a fondness for a certain area, and deal with stress a lot better when they are there. Negative quirks can be cured, but that costs time and money. Some quirks aren’t bad enough to need immediate attention, but others will require treatment asap. Bring on ALL the bad guys! On occasion, heros can become virtuous when their resolve is tested. Instead of succumbing to the rigors of combat, these heroes display true courage and rise to the challenge. This doesn’t happen very often, but when it does, it’s totally awesome. When a hero becomes virtuous, they, and sometimes the party, receive buffs. Each virtue gives different buffs, but all virtues have a few in common. All virtues immediately reduce the hero’s stress bar, and sometimes the stress of the party. Additionally, that hero will gain a huge amount of stress resistance, making it very difficult for them to succumb to a heart attack. Virtues heros will also periodically encourage other party members, reducing their stress. A hero will remain virtuous throughout the entire adventure, but will lose the benefits upon returning to town. One important thing to note is that the same hero might not always become virtuous, and heroes who previously had mental breakdowns can also become virtuous. Squads can only move forward or backward, and clicking and right-clicking handles every other action. This simplicity gets rid of having to learn complicated combat maneuvers, and since it’s so basic, you won’t need fancy hardware to do well. Additionally, the simplicity allows you more time and room to formulate combat strategies, which is one of the most important tricks to keeping heroes alive as long as possible. You will lose many heros throughout the game. They will die horrible deaths, and in the name of progress, you won’t be able to stop it. 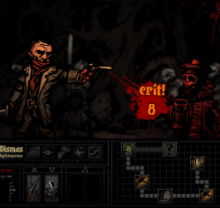 Whether it be through hp loss or heart attacks, the enemies in Darkest Dungeon are very good at killing your heros. Not all adventures will even end in success, if all your party members die, you will lose everything they were carrying. This makes resource management important. You may not always be able to afford to reduce your heros’ stress, or even properly provision them for an adventure. However, the show must go on. While out adventuring, heroes behave a lot like typical fantasy characters. They will say and do things, sometimes to each other, that cause them to develop a personality, as well as change their relationship with the group. Heroes also need to eat and sleep, something not usually found in games. If you run out of food, your heroes get stressed and lose some hp. If they are able to eat, they become happier and heal a bit. There are also many items that can be used in the dungeon to help a hero, like bandages to stop bleeding. There are also environmental tools, like shovels, that make clearing obstacles easier. The game also features a large number of trinkets that affect the hero’s stats. Some are usable only by certain classes, but all do something when worn. Light is an important resource to monitor while in a dungeon. It constantly decays, and using torches increases the amount of light you generate. There are several stages of light, from brightly lit to completely dark, and each provides bonuses to your party. The brighter it is, the easier combat becomes. You hit more often, and will surprise enemies more often. However, you receive less loot and critical hits happen less often. On the other hand, when it is completely dark, you score more critical hits and find more loot. However, you are more likely to be surprised, and heroes will get stressed out more easily. The amount of light you choose to keep up is entirely dependent on your play style. More cautions players tend to prefer keeping a bright torch, while more daring players adventure in total darkness. 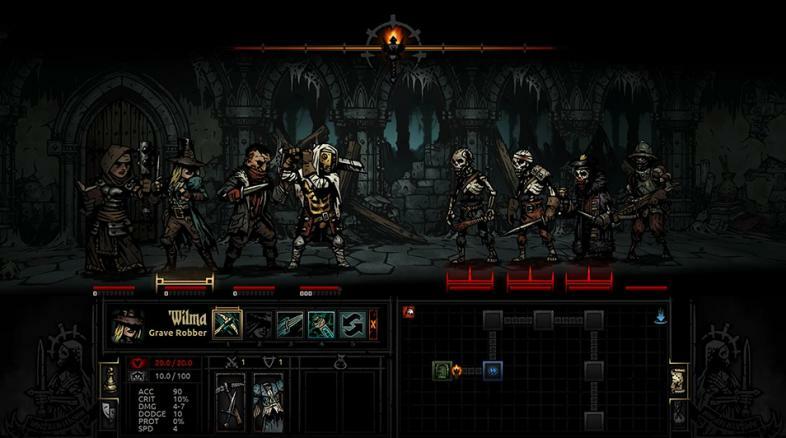 Darkest Dungeon features many different classes that heroes come in. Some classes, like the man-at-arms, are up-in-your-face melee fighters, and make excellent tanks. Other classes, like the arablast, are most at home in the back, raining arrows upon their enemies. Each class has unique abilities and strengths, and it is important to plan your party accordingly for what you will need. Some classes also work together better, such as clerics and crusaders. They are both holy, and some skills will work better if the two are together. The standard party composition of tank, healer, and dps is a pretty good set-up, but might not always be ideal based on what you’re up against. What do you think of the game so far? Leave your impressions of the game in the comments below.